The centerpieces are one of the most important parts of the wedding reception. They are the design element that will really set the tone for the whole affair. If you are looking for wedding centerpieces that are fresh, modern, and surprisingly affordable, consider displays of submerged flowers. Brides want their centerpieces to be big, beautiful,and showy, and yet sometimes will find it to be prohibitively expensive to have enormous floral displays. After all, think about how many flowers go into just one large floral centerpiece, and then multiply that by ten or more tables, and suddenly you will find yourself with enough flowers to stock and entire florist shop! It can be particularly tricky to balance style and budget when you fall in love with one of the pricier blooms. 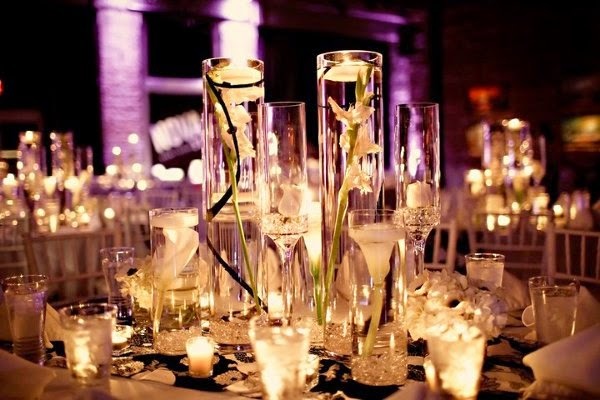 There is, however, a very chic way to get impressive looking centerpieces without totally blowing your budget. 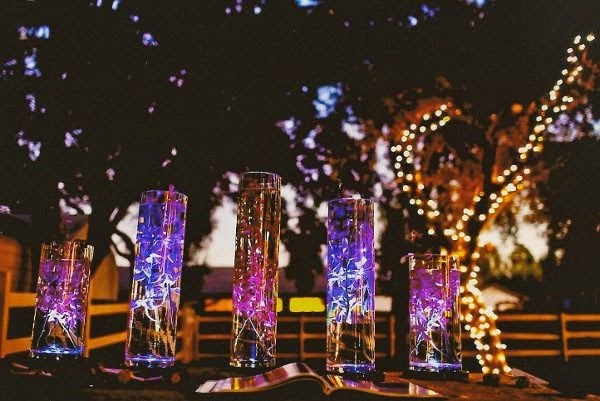 One of the hottest wedding trends right now is to fill tall clear cylinders with water, and then have the florist submerge flowers in the vessels. It is a unique concept, and yet it is truly beautiful when you see the finished effect. The best part is that you only need a few flowers per cylinder, since it is a narrow space. 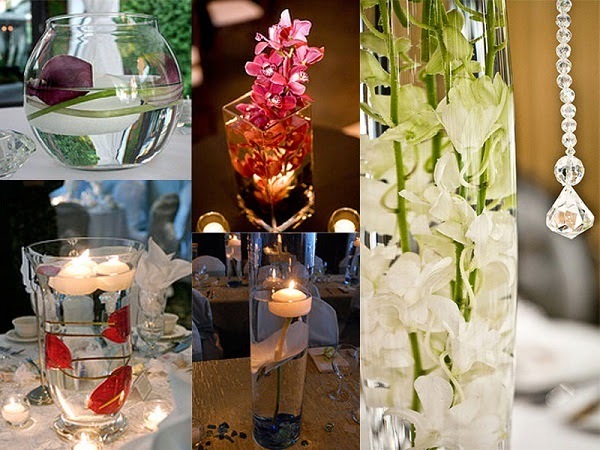 Many favorite wedding flowers will work very well in submerged centerpieces. Tulips, orchids, berries, and amaryllis are all excellent choices, and they come in beautiful colors. Speaking of colors, with this type of arrangement, it is best to keep the look monochromatic for the cleanest effect. It is a modern chic style of centerpiece, so you want to keep it as unfussy as possible. Once you have chosen a type of flower, you can get creative with the details. For instance, for a truly striking table, use multiple cylinders in varying heights in the center. You can either use the same kind of flower in each vase, or choose different flowers in the same color palette. Orchids are one of the most popular choices for submerged flower centerpieces, and they are available in some fabulous colors. You can also choose to add some detail to the vessels, in the form of a decorative element at the bottom of each vase. For a Zen look, "plant" your flowers in a mound of smooth black pebbles in the bottom of the cylinders (which could also be rectangular, by the way). If you are going for an opulent evening look, then Swarovksi crystals make a fantastic element in the bottom of your vessels. These are the same crystals that are found in fabulous crystal bridal jewelry, and they will look amazing when the candlelight bounces off of them underwater. You can choose to match the color of the crystal used in your bridal jewelry, or go for a bold choice like deep red. There are a few more ways to customize your centerpieces. 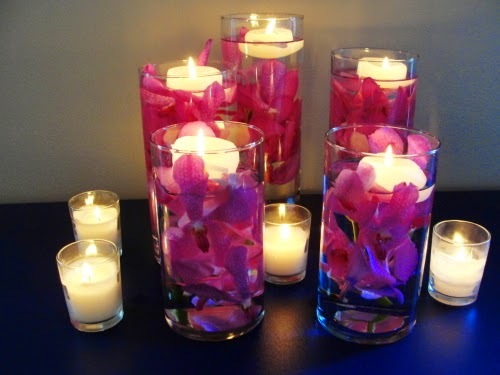 Candles can be floated in the water on top of the flowers for a very pretty spa effect. For brides who want to have spectacular wedding centerpieces, and are willing to splurge, the ultimate in high style is to set a full floral arrangement on top of a submerged floral display. With so many ways to design them, submerged floral centerpieces are one wedding trend that is here to stay.